After our breakfast from the hotel, we will set out for exploring around. Some of the historical sites that we will be visiting today at Thimphu are Buddha Statue, Textile Museum, Changangkha Lhakhang, Simtokha Dzong and Tashichho Dzong. Simtokha Dzong: Located around 5 km south of Thimphu town, Simtokha Dzong is the oldest Dzong in Bhutan built by Zhabdrung Ngawang Namgyal in 1629, it is believed to have been built over a stone onto which Zhabdrung Rinpoche pinned down a demon and subdued it. The Dzong contains the bed chambers of Zhabdrung and Desi Jigme Namgyal, the father of the first King of Bhutan. Formally known as Sanga Zabdon Phodrang (Palace of the Profound Meaning of Secret Mantras), the Dzong contains many sacred relics. Tashichho Dzong: Located on the bank of the Wangchu River in the Hejo village, Tashicho Dzong was built in 1641 by Zhabdrung Ngawang Namgyal and enlarged in 1694 by Gyalse Tenzin Rabgay. 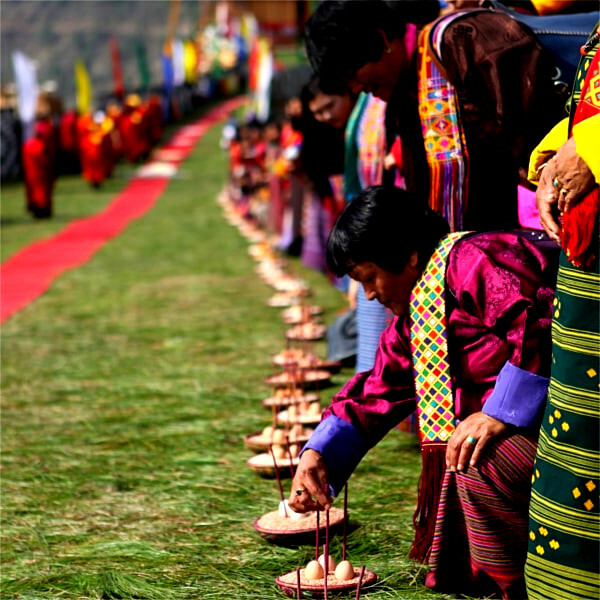 It was entirely rebuilt under the command of Third King Jigme Dorji Wangchuck in 1962. Today, the dzong is the seat of the central government, His Majesty the King’s office, and the summer residence of the Central Monastic Body. Drive to Kabesa from where the trek begins. 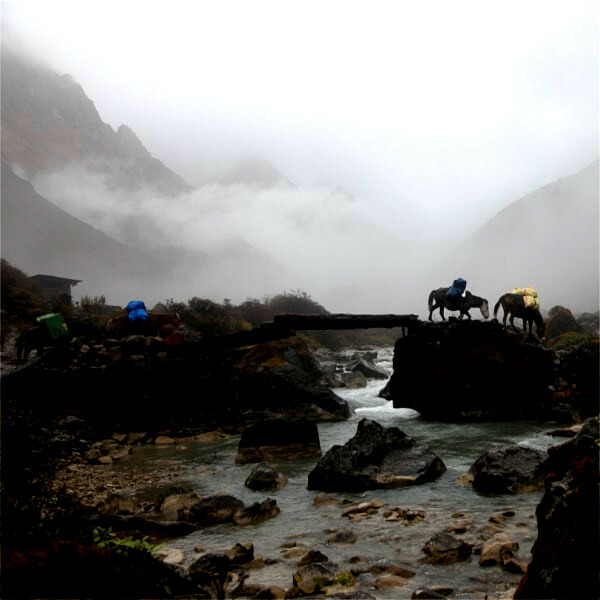 After trekking for around 4 to 5 hours through a pine and rhododendron rich forest, you will finally reach your campsite located below Sinchula pass at an altitude of 3400 m above sea level. After our breakfast we will slowly ascend towards Sinchula pass (3500 m) and from there the trail will narrowly descend down till we reach our next stop at Dupsingpang campsite. 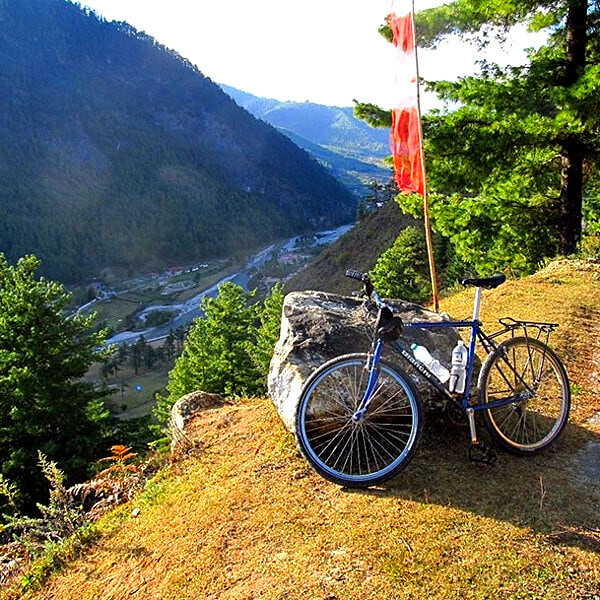 The Sinchula pass is marked by a small stupa, from where the spectacular view of Himalayan ranges can be enjoyed. Today, we will be descending down for an 8 long hours till we reach Chorten Nyingpo, our extraction point. After traversing through several beautiful villages and numbers of stream, you will finally see your tour vehicle and driver waiting for you. From here, drive to Punakha and relax after reaching your hotel. In the morning, visit to Punakha Dzong and then slowly start driving towards Paro. On the way, pay visit to Chimi Lhakhang and drive to Paro via Dochula pass. Khemae Lhakhang: Located on a hillock in Lobesa (Punakha), the temple was built in 1499 by Lam Ngawang Chogyal, the brother of Lam Drukpa Kunley, on the spot where the latter subdued a demon who was running away in the form of a dog. Lam Drukpa Kunley buried the demon and said there was no dog now (khe – dog; mae – no). Hence, the temple came to be known as the “temple of no dog”. Today however it is pronounced as Chimi Lhakhang. The temple contains the bow and arrows of Lam Drukpa Kunley and a phallus to bless the visitor. After reaching Paro, check into your hotel and relax. Highlight of today’s tour includes visit to Paro Taktsang monastery, Drugyal Dzong and Kichu Lhakhang. Paro Taktsang monastery: Depending on your pace and the time you spent in Monastery, hiking to this monastery will take around 5 to 6 hours (roundtrip).